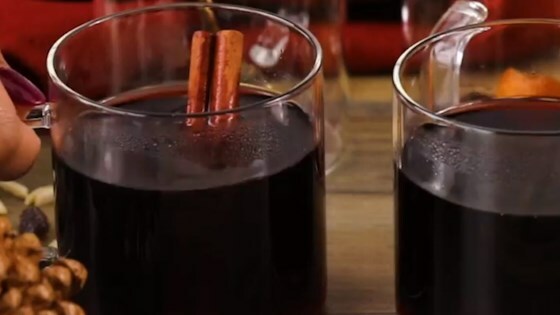 "Glogg is warm served during the Christmas holidays in Sweden and other Scandinavian countries, as it is sweet, spicy, and warming. This is the adult version of the drink, so don't serve it to the kids! Garnish drinks with raisins and slivered almonds. Serve warm with gingerbread cookies." Gently simmer the red wine, port wine, cinnamon sticks, whole cloves, and orange peel in a large pot set over medium-low heat. Stir in the sugar, rum, and brandy. Continue simmering 5 minutes more, stirring to completely dissolve the sugar, and the mixture is steaming but not boiling. Mix the raisins and almonds together in a bowl. To serve, ladle into coffee cups or Swedish-style small glass or ceramic mugs. Garnish each cup with a spoonful of the raisin and almond mixture. With the addition of cardamom this is the exact recipe Mom & I made year in and out. Great memories now with every sip. I remember this from growing up with a Swedish grandfather! Many happy Christmas memories! Tack sa mychat!! Yum. Made with a sweet/dry wine so left out port. Added the Cardamon as suggested. Made the rest of the recipe as is. Oh so good. Just the thing during a snow storm to warm us up.